I am an administrative employee and my department is undergoing some major changes, one of them is the hours that we will be open and the task of covering all of those hours with limited staffing. I understand that in this position we work until the job is done, but also that should allow some flexibility for the employee also. My question is, is it appropriate to ask administrative employees to work additional hours on a regular basis (to cover open office times)? I realize that this may be at the discretion of the employer but I would like some more clarification on the law. I would even appreciate some direction to resources that could help me with this question. Anytime you ask employees to work more hours, it can become a bit touchy. They don't want to work more, but you need them to do more. Is it appropriate? Well, yes. The business has needs and it's appropriate to ask your employees to meet those needs. How you go about that, though, can make all of the difference in the world. Here are the questions you need to know the answers to before you implement any changes. Are the Employees Exempt or Non-Exempt? Exempt employees can work as many hours are you want them to without increasing their pay. You must pay your Non-exempt employees for every hour they work. They also must receive overtime pay when they reach 40 hours a week (and in some states, if they work more than eight hours in one day). You cannot just say, “I want everyone to be on salary.” In order to pay people a salary without any overtime pay, their jobs must meet the strict criteria required by federal law. You need to cover additional hours, but do you need to have full staff on at all times? Let's say your current hours are 9:00 to 5:00 and you have five employees. Now, your hours are 8:00 to 6:00 with the same five employees. Can you have two people come in at 8:00 and work until 4:00, two come in at 10:00 and work until 6:00, and have one stay at 9:00 to 5:00? Then everyone is working the same number of hours and someone is always in the office. There are numerous solutions. 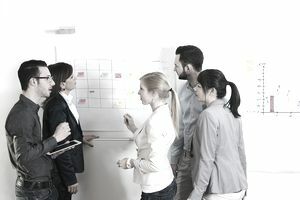 You can spend hours and hours in planning meetings and come up with a solution that everyone hates, or you can ask your employees what they think. You may find out that Jane would love to come in early and leave early and that Steve would love to start later. Everyone may jump at the chance to work 10 hours, four days a week. You won't know if you don't ask them. What If Hours Have to Increase? While it's true that an exempt employee can work more hours without an increase in pay, you will lose loyalty. For hourly employees, of course, you'll have to sign off on overtime pay without any criticism or moaning about the cost. For exempt employees, you'll need to come up with something to compensate them. The easiest thing to do is increase salaries. If that's out of the question, you'll need to come up with something else. Ask your employees what they are interested in. Sometimes people are willing to jump in and do some extra while you're hiring a new employee to cover the extra hours. But, when it becomes clear that there is no one new coming, people become resentful. So, don't lead them on. If this is a permanent situation, you need to make that clear from the beginning. Have You Explained the Reasons for the Change? When you're making a big change, you need complete transparency. The employees need to understand the reasons and you need to listen to them. You are probably not going to have an easy transition, but if you address all of these issues, it should go smoothly. You may have an increase in turnover, but then when you bring new people on board, they will know from the beginning how the hours and schedule work.